annie's littlefootprints: Has it really been that long? Oh dear, it seems as though I've been neglecting my poor little blog for way too long. Well, the good news is, I have a little mini kit all ready for you! 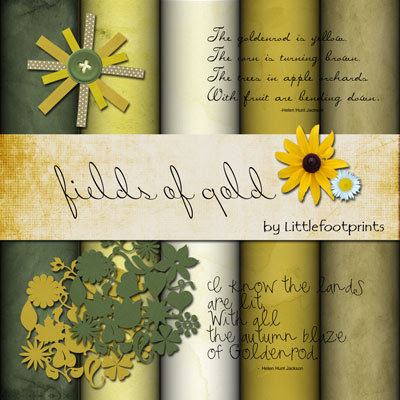 It is called "Fields of Gold" and was inspired by a photo I took of goldenrod in a field. I like to get my inspiration for colors from photos, it makes the papers have more natural colors. There are 5 papers, 2 flowers, two mats, one button/ribbon embellishment and, of course, 3 wordarts. Hope you like this one.